At some point after learning how to brew from grains, most all-grain brewers begin to think about ways to increase their extract efficiency — the amount of extract they obtain from their grain, relative to the maximum possible. (Here, “extract” means carbohydrates and other soluble substances that contribute to the wort’s specific gravity, not malt extract.) Because you can put a number to this, it’s human nature to want improve upon this number. There are several ways to increase your extract efficiency, but often there is a tradeoff. Finely crushed malt yields more extract. For most homebrewers, getting a better crush is the most effective way to increase their extract efficiency. The more finely malt is crushed, the higher your extract yield. However, finer crushes also lead to lautering problems, as larger husk pieces create a more porous grain bed that allows liquid to flow through with less resistance. In addition, because the husks are reduced to smaller pieces in finer crushes, thereby exhibiting a higher surface to volume ratio, the possibility of extracting an excessive level of tannins is increased. One approach many homebrewers take is to progressively mill their grain more finely each batch they brew. Once they encounter a problem with lautering, they back off a notch for the next. This trial and error approach works well for finding the best tradeoff between extract efficiency and lauterability on your system. One way commercial brewers seek to get better efficiency without incurring lautering problems or running the risk of excessive tannin extraction is by conditioning their malt. 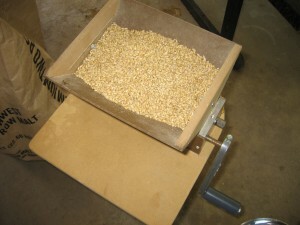 In malt conditioning, the grain is lightly wetted (usually from steam) immediately prior to milling. This makes the husks slightly more pliable, allowing the brewer to crush the interior of the grain more finely, while leaving larger husk pieces. There are two temperature-related effects on extract efficiency. The first is that higher temperatures are better at dissolving soluble solids (such as starches). In addition, a solution with dissolved solids is generally less viscous at higher temperatures. As such, higher temperatures lead to better extract efficiencies. In brewing, there is the added twist that sugars are more soluble than starches in water, so the more sugars you produce, the more soluble your solids and the higher your extract efficiency. However, higher temperatures are not only better at extracting desirable compounds, but undesirable ones as well, and increasing temperatures lead to the increasing extraction of tannins (and silicates). The compromise that most brewers use is to first mash the grain at a temperature that favors the conversion of starches to sugars. (For best results, your mash pH should also be in the proper range — pH 5.2–5.4.) Then the temperature is raised to the maximum safe temperature before the wort is run off. The actual temperature for excessive tannin extraction varies with wort pH. At the end of sparging, when the pH of the wort in the grain bed will have climbed to around 5.8, brewers strive to have their mash at 168–170 °F (76–77 °C) or lower. Performing a mash out, or heating your sparge water such that your grain bed temperature increases to 170 °F (7 °C) by the end of sparging will increase your extract efficiency by lowering the viscosity of your wort. Stirred mashes yield more extract. Stirring mixes the grains and liquids so that grain solids are constantly exposed to liquid. The vast majority of commercial mash tuns are stirred constantly for this reason. Unfortunately for most homebrewers, stirring the mash also means losing heat. You could add boiling water to compensate whenever you stir, but that thins out your mash. If you can directly heat your mash tun (especially if you can heat and recirculate your wort), stirring your mash several times during saccharification will improve your yield. If you can’t heat your mash tun, experiment to see how many times you can stir and still stay within an acceptable temperature window. Rinsing the grain bed with more sparge water increases your yield. Sparge volume is sometimes an issue when homebrewers make high-gravity beers. When many homebrewers make a big beer, they sparge only to the point where they have collected their usual pre-boil wort volume. 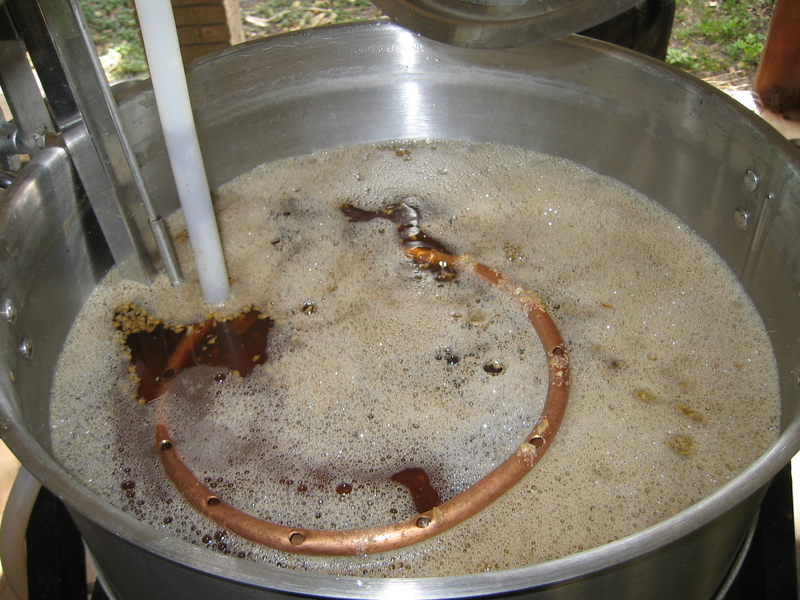 Because the volume of sparge water has not increased apace with their increase in malt, they suffer increasingly poor extract efficiencies for progressively higher OG beers. The only way around this to collect as much wort as you can (if the volume of your kettle allows), and take some extra time to boil this volume down. Improving your extract efficiency has several benefits. Firstly, and most obviously, brewing becomes more economical, because it requires less grain to brew your beers. In addition, brewing high gravity beers is much easier. Advanced all-grain brewers will want to increase their extract efficiency if they can do so without sacrificing beer quality (or incurring too much hassle). However, brewers should also consider that the point of brewing is to make good beer. If your extract efficiency is high enough that you can produce beers you enjoy, don’t worry that some other guy is claiming to get 90%. Getting a consistent, reasonably-high level of extract efficiency is all you need. Good article, Chris. It’s nice to see that you mentioned the truths of batch sparging! Using batch sparging and my cooler with a braid, I can crush very fine without conditioning the grain and have never had a stuck runoff in 443 batches…I probably just jinxed myself! Also, with batch sparging the worries of oversparging are pretty much eliminated. I average 84% efficiency, which is good enough for me! Thanks, Denny. 84% is indeed pretty good. I have a question about efficiency. Does efficiency apply equally to sugars, flavors and colors? What about different malt types? Will a grain bill with 85% base malt and 15% crystal or roast malts (most of the color is coming from the specialty grain) be darker at 85% efficiency than at 65% efficiency? So if I am scaling somebody else’s recipe for my expected efficiency…should I scale all the grains, or just the base malts? When scaling a recipe to account for efficiency, I leave the amounts of specialty grains alone and scale the amount of base malt (2-row, Pilsner, etc.). The idea is that a given amount of specialty grain is going to contribute roughly the same amount of color, flavor, etc. no matter what your efficiency is. D as well saved too my bookmarks.